Scott Barton began working with RBS 16 years ago after his tenure with Andersen Consulting. Initially focused on corporate coverage in London, he then spent four years in New York and Houston. After the merger of RBS and ABN Amro, Barton moved to Dubai to run the bank’s Middle East and Africa hub, which included the global banking and markets businesses. In 2009 he returned to the United Kingdom to run the corporate banking area and most recently became chief executive officer of global transaction services. He is also a member of the Chartered Institute of Marketing. In 2008, Gunnar Berger was appointed head of treasury services, a unit responsible for developing and maintaining a vast portfolio of cash management products for corporate treasuries, financial institutions and banks. Berger’s unit has focused on developing tools for liquidity and risk management. Nordea’s treasury services unit is also focusing on developing a European offering and launching a new global cash pool solution. Berger has many years of experience in the banking industry. In his present post, William J. Booth is responsible for the oversight of risk and compliance, creation of the annual strategic and financial plan for this $1 billion–plus business, and he leads its communications and marketing functions. Since joining PNC in 1991, Booth has served in many leadership roles including sales management, execution and strategy. He established PNC as a champion of education-based initiatives in collaboration with the Association for Financial Professionals. Most recently, Booth helped integrate the treasury management sales functions of PNC and National City. Paul Camp has bolstered Deutsche Bank’s award-winning position as a payment-and-cash management services provider to financial institutions around the world. Camp’s innovative focus on currencies, capabilities and markets has helped establish the bank as an industry leader. Camp is also active in shaping the payments market’s future with his board membership on Eurogiro, a financial messaging company for postal organizations. In her present position since May 2006, Alberta Cefis is leading the evolution of cash management, payments, trade services, correspondent banking, e-commerce and e-banking at Scotiabank. Cefis joined Scotiabank in 1999 and has extensive experience in banking. In 2010 she was named a recipient of The International Alliance for Women World of Difference 100 Award, which honors 100 women from around the world for their contributions to economically empowering women. Andreas Chasapis has headed the corporate transaction banking (CTB) division, part of the bank’s wholesale banking business, since October 2008. Based in Athens, Chasapis joined Eurobank in 1994 and oversees the end-to-end performance of the cash management, trade services, electronic corporate sales and factoring business. He is responsible as well for the CTB units in Romania, Bulgaria, Serbia, Turkey and Cyprus. Eurobank is a European banking organization that is part of the EFG Group, an international banking group with a presence in 40 countries. Gail Cocker has led BMO’s commercial banking in Canada since 2007. Her mandate was expanded this year to include global treasury management, supporting BMO’s efforts to provide comprehensive financial solutions for its customers. Cocker and her teams aim to grow the Canadian commercial banking and global treasury management business. Her experience at BMO has ranged from the corporate and government banking area to leading risk management and operations. In this slot since January, David Cruikshank sets the strategic direction and leads the execution of the company’s global payment, trade finance and cash management businesses. With more than 20 years of experience in treasury services, he joined BNY in 2003 after working within the global transaction service organizations of Citibank and ABN Amro Bank. Cruikshank was most recently the global head of sales and relationship management for treasury services at BNY Mellon. In this position since 1997, Sigurd Dahrendorf previously headed the finance department of this German manufacturer of braking systems from 1992 to 1997. He served as managing director of Knorr-Bremse Harzer Kompressorenwerk, Benneckenstein, a company of the Knorr-Bremse Group, from 1990 to 1991. Dahrendorf was department head and chief financial officer for a group producing pumps and compressors in East Germany between 1978 and 1990. George Dessing is responsible for global treasury and risk management activities at Wolters Kluwer, a global information services and publishing company based in Alphen aan den Rijin, the Netherlands. Before joining Wolters Kluwer in 1997, Dessing held various positions at NetHold Finance, part of the FilmNet Group, in the Netherlands and Belgium. Dessing is a board member of the Dutch Association of Corporate Treasurers. Chris Foskett is managing director and Global Financial Institution Sales and Segment Executive for J.P. Morgan Treasury Services. He is responsible for leading the Treasury Services Western Hemishpere sales team, providing day-to-day sales management. He also leads the Global Segment team, driving global thought leadership for FIs, Non-Bank Financial Institutions and Federal Government segments. His extensive knowledge and long career in financial services allows him to bring strategic direction to FI clients in M&A;, bank relationship management and corporate/commercial banking products. Michael Gallagher has more than 25 years of transaction banking experience and joined HSBC in 1997 as a senior vice president. In his present position, Gallagher is responsible for the group’s currency-clearing activities for the financial institutions sector worldwide. He also is responsible for HSBC’s payments and cash management division for North America. Before joining HSBC, Gallagher held several senior positions at CoreStates Financial Corp. in Philadelphia, Tokyo and New York. He is chairman of The Clearing House’s PayCo Board and a member of the Federal Reserve’s Payments Risk Committee. HSBC Bank USA is a subsidiary of HSBC Holdings. Phil Griffiths is responsible for setting the strategic direction of the bank’s cash management, trade finance and correspondent banking businesses as he manages the sales, product and service teams. He joined CIBC in 2011 after working for 25 years with another major Canadian bank, where he held several management and executive positions in global transaction banking, shared services, electronic commerce, merchant acquiring, security, international audit and branch banking. He has obtained his Certified Management Accountant designation. Alain Grugé heads the bank’s worldwide corporate cash management business line, which provides domestic and international cash management to corporates in more than 50 countries. Grugé has more than 30 years’ experience within the Société Générale Group, including various positions in the French network in the corporates market and eight years in investment banking as head of the French media and telecom sector. Grugé was previously managing director of the Paris Rive Gauche enterprises branch, one of the four Société Générale branches specializing in commercial banking activities for large corporations. Doug Hartsema is the director of treasury management at Huntington Bank in Columbus, Ohio—a regional bank with 600 offices in six Midwestern states in the United States. He is responsible for strategy, sales, product development, service, implementation and delivery of the bank’s suite of treasury management services. Before joining Huntington, Hartsema was responsible for the receivables management business at J.P. Morgan Chase and spent the early years of his treasury management career at Wachovia. Hartsema is chairman of the Institute for Financial Operations, a mesh of several trade associations serving the accounts payable, accounts receivable, transaction processing and document capture industries. François Masquelier joined RTL Group, a leading European media company, in November 1997 and previously worked for Eridania Béghin–Say (Coordination Centre) and ABN Amro. He is president of the Association of Corporate Treasurers of Luxembourg and honorary chairman and founder of the Euro Associations of Corporate Treasurers. He was appointed a specialist at the Institute of Risk Management in November 2009 and is also a certified Internal Controls Institute Specialist. A contributor to various corporate finance and treasury publications, Masquelier is editorial director at Magazine du Trésorier , a quarterly publication dedicated to treasury and corporate finance issues. Patrick Moletteri joined Celgene Treasury in December 2006 as the company launched a global plan to commercialize its primary drug, Revlimid. His responsibilities include managing Celgene’s relationships with the debt-rating agencies, global banking and cash management, global cash forecasting, back-office support and credit and collections. Patrick supports a team of four treasury professionals that manage Celgene’s global treasury operations and are implementing a new treasury management system. Before joining Celgene, Moletteri worked at AT&T; for several years and spent a decade as director in the treasury organization, where his responsibilities included global cash management and banking, corporate finance and bank credit facility negotiation. Julie Monaco leads a team of more than 6,000 employees to meet the complex transaction banking needs of more than 8,000 corporate, financial institutions and public sector clients. Under Monaco’s leadership the business has established itself as a top provider for cash management, trade, supply chain finance, as well as custody, fund administration, hedge fund middle office and private equity fund administration. Monaco has more than 26 years of experience in banking and is a member of the International Council of The Elliott School of International Affairs at George Washington University. Based in Singapore, George Nast joined the bank in January 2010 with a primary mandate to ensure that the bank’s suite of transaction banking products meets client needs. Before joining Standard Chartered Bank, George was a partner at McKinsey & Company where he headed up the management consultancy’s Asia-Pacific wholesale banking practice. He has also worked with several central banks and regulators in Asia on capital markets development, regulation and policy. Nast also has worked in the finance industry in North America. Before joining McKinsey, he worked as a financial markets analyst and trader in the open market operations of Canada’s central bank. A 21-year veteran with Wells Fargo, Danny Peltz is responsible for global treasury management services for the bank’s corporate and commercial customers and oversees a team of more than 1,900 product, sales, delivery and marketing professionals. He also manages Wells Fargo Health Benefit Services, an administrator of health savings accounts for companies and individuals. Peltz oversees the industry’s top-ranking treasury management organization and has been at the forefront of the paper-to-electronic revolution. He has focused on providing customers with innovative and easy-to-use products and services. Diane R. Quinn is responsible for driving global revenue growth for multinational corporate clients around the world. She and her team work with large companies to find efficiencies in their financial supply chains, give them the right financial network to support their international growth plans and help them benchmark their activities against their peers. Quinn’s expertise and thought leadership has helped J.P. Morgan deliver innovative solutions to support corporate clients’ needs wherever they do business, and has helped fuel the direction of J.P. Morgan’s international growth agenda. Based in New York and recently appointed to this new role, Diane S. Reyes is global head of payments and cash management, where she helps clients find cash management and payment solutions across borders and currencies. Reyes was previously global payments head for Citi’s Global Transaction Services, and before joining Citi in 2000, Reyes held senior positions at JPMorgan Chase. In 2006, she was recognized as the “2006 Woman of Achievement” by Girl Scouts of Southwestern Connecticut for her support of the development of leadership and self-esteem programs for girls. With worldwide responsibility for treasury, corporate development and investor relations, Helen Shan is accountable for capital markets, risk operations, pension fund management, bond and equity investor communication and strategic corporate actions. She also serves as a member of the chairman’s council and is a corporate officer. Shan joined Pitney Bowes in the fall of 2005 after 13 years in banking with JPMorgan Securities and Salomon Brothers. Her most recent role at JPMorgan was as managing director, diversified industries. She is a member of the Advisory Council at the Johnson School of Business at Cornell University and is involved in Asian Professional Extension, a New York City nonprofit organization that promotes the development of Asian-American youth. Michael Spiegel has strengthened Deutsche Bank’s position in trade finance and corporate cash management, focusing on the development of global strategies, platforms and processes as well as a risk and portfolio management function. 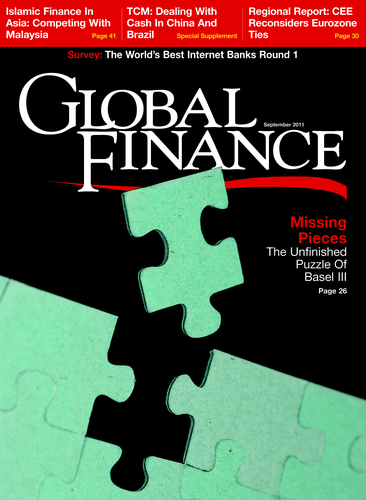 Spiegel drives technology investments, including the bank’s global rollout of a fully integrated vendor finance solution. He oversaw business integration of the bank’s recent acquisition of parts of ABN Amro’s commercial assets, which makes Deutsche Bank the fourth-largest commercial bank in the Netherlands. In this post since 2005, Markus Straußfeld is responsible for cash management and e-banking sales to large corporations and multinationals in Europe, the United States, Asia and EMEA. He also is chairman of the board of the IBOS Association. Straußfeld has held various positions in cash management at WestLB and Commerzbank. He is a member of various SWIFT modeling groups and has been a speaker at several national and international trade fairs and events, such as the Finance Symposium in Mannheim, Germany. Naveed Sultan is global head of treasury and trade solutions for Citi’s global transaction services business and has more than 24 years of institutional banking experience. He has worked with Citi for more than 18 years. Before this role, Sultan was GTS Region Head for Europe, Middle East and Africa. He also serves as a director on the board of Citibank Europe and Citibank (Turkey), and is a member of Citi’s EMEA operating committee and the management committees for the institutional clients group and global transaction services. Colleen Taylor is responsible for developing and managing a geographically diverse group of treasury management teams engaged in sales, product management, business development, implementation and servicing efforts for the bank’s real estate, middle market and small business banking groups. She also leads the merchant services business. Taylor joined Capital One Bank in 2009 with nearly 20 years’ experience in the financial services industry, all within the treasury management and merchant services areas. Before joining Capital One, Taylor was a senior vice president at Wachovia Bank, where she led Wachovia’s strategic liquidity management efforts. Keith Theisen is responsible for strategy, development and technical consulting, Wells Fargo’s treasury management products, which include domestic and international collection, disbursement, information and investment solutions. Theisen has more than 35 years of experience in treasury management products with Wells Fargo and its predecessor, Norwest Corporation. He has been instrumental in driving the migration from paper to electronic payments. A Certified Cash Manager and Accredited ACH Professional, Theisen has served for six years with the National Automated Clearing House Association’s board of directors. Chris Van Tieghem joined the treasury department of Wienerberger, the world’s largest producer of bricks, in Vienna in 2006. He previously worked for Koramic Building Products in Belgium for more than 20 years. In addition to developing cash management and netting and implementing a payment factory at Wienerberger, Van Tieghem recently implemented a group-wide credit insurance program. Over the past five years, Chris has helped initiate an ambitious cash management and payments transformation project, and these functions are now centralized in treasury. Van Tieghem’s vision and strategy have played an integral role in helping Wienerberger lay down a leading-edge cash and payment transformation project. As managing director and global head of sales and relationship management for BNY Mellon’s treasury services business, Verschoyle-King directs the company’s efforts to expand revenue in targeted markets. Verschoyle-King previously served as treasury services’ head of Europe, Middle East & Africa. Verschoyle-King has been involved with the transaction banking and client management businesses for more than 20 years. He joined BNY Mellon in 2006, after six years with ABN Amro Bank in London and Amsterdam. A leading Indian banker and an expert in the cash management, transaction banking and treasury areas, Bhavesh Zaveri joined HDFC Bank in 1998. He played a key role in establishing and expanding the bank’s cash management business and leading its work in the trade finance areas. He is a founder director of National Payment Corporation of India, an initiative of the Reserve Bank of India to build a next generation payments platform for the country. He is on the board of The Clearing Corporation of India (CCIL). CCIL provides a trading platform as well as complete settlement services for treasury products.